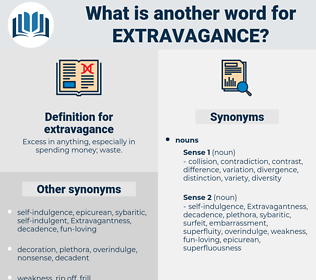 What is another word for extravagance? 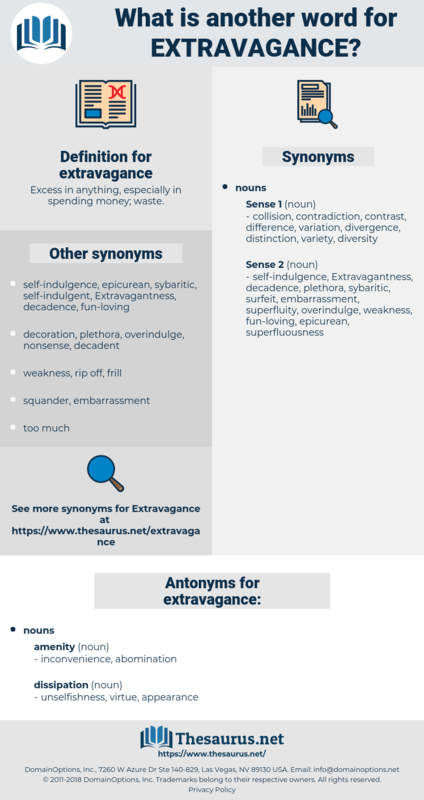 Excess in anything, especially in spending money; waste. wastefulness, luxury, wastage, waste, squandering. providence, thrift, economy, moderation, thriftiness, saving. caution, calmness, lukewarmness, calculation, restraint, deadness, timidity, temperateness, policy, wariness, dulness, penny-pinching, conservation, coldness, indifference, prudence. Isn't it true that George Eveleth was a rich man when you married him, and that your extravagance ruined him? His wife was fortunate in the fact of her property being settled upon herself, and in having sufficient ability to keep up the banking - house in Saumur, which was managed in her name and repaired the breach in her fortune caused by the extravagance of her husband.